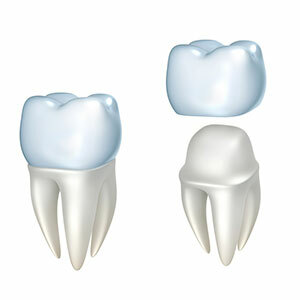 Crowns or permanent bridges can occasionally come loose or come off your tooth. It is important to call Robert J Malone, DDS as soon as possible to determine what treatment will be necessary. If your crown or bridge is loose, but not completely off, hold it between your fingers and try to remove it and to make sure it is secure enough so that it will not dislodge while you are talking, eating, or sleeping. It is important that it is not swallowed or aspirated into your lung. If the crown comes off easily, DO NOT SLEEP WITH IT IN YOUR MOUTH. If your crown or bridge is completely off, inspect the inside surface. If it appears hollow, then none of your tooth has come out with the crown. Occasionally, part of the tooth or filling underneath the crown becomes dislodged with the crown. This would make it more difficult to seat the crown back on the tooth. Gently clean the inside of the crown with a toothbrush and a toothpick to remove any debris or cement. Completely dry the inside of the crown or bridge. If the crown is able to be temporarily seated back and feels snug, it may be okay to use it during the day only. Do not chew directly on the crown, however. Please note that the crown or bridge will only fit one-way on the tooth. If it will not seat easily, then do not replace it. As an aid in retaining the crown temporarily, Vaseline or denture adhesive (i.e., Fixodent) may be placed inside the crown before seating it in right direction. Make sure you bite all the way together to make sure the crown seats all the way down. Otherwise, your bite may be “high,” which could make the tooth sore over time. Please note that some crowns that have been placed on teeth that have had a root canal may have a post that was placed in the root of the tooth for strength and retention of the crown. It is possible that the post can be bent, preventing the crown from seating back on the tooth. There are temporary cements available over-the-counter. Caution should be used with these since some of them are too thick to allow the crown to seat properly. Also, the may set quickly, making it difficult to work with. DO NOT USE ANY SUPER GLUE OR HOUSEHOLD GLUES to put the crown back on your tooth. These products are TOXIC and will damage your tooth and nerve. It is important to get the crown reseated as soon as you can to avoid any movement of the adjacent teeth. This would cause your crown to no longer fit. It is possible that the crown has been loose before you became aware of it. The longer a crown is loose, the more likely the tooth underneath will start to decay. It is also possible that tooth decay under the crown is the reason it came loose in the first place. A loose bridge is more challenging, especially if only one of the anchors is loose. It is likely that the other anchor(s) are holding tight. In this case, the bridge will have to be removed to determine if it can be reused. It is important to call our office as soon as possible if your crown is loose. The crown will be examined and an x-ray will be taken to find the reason the crown came loose. It is possible that the crown came dislodged to eating sticky food or candy. Most of the time, the crown can be successfully removed and re-cemented. The most common reason a crown becomes loose is the presence of tooth decay underneath the crown. If this is the case, it is important to remove the crown to clean away the decay to prevent further damage to the tooth underneath. If your crown comes completely off, it may be ok to leave it off for a short period of time until you can come to our office. This is especially true if the tooth is not sensitive or painful. Many times the tooth may be sensitive for a short period of time right after the crown comes off, but then settles down. Call (760) 746-2559 now to determine what treatment will be necessary.